It's not complicated. We design elegant, functional, uncomplicated sites that reflect the image our clients want to present. Our sites are natural and uncluttered. 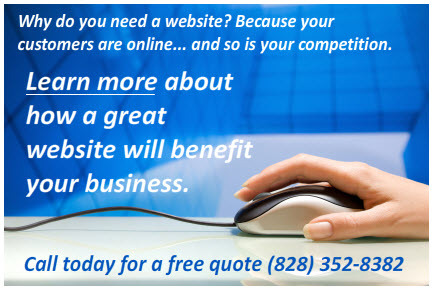 We design sites to draw attention to our customers' businesses and organizations - not to the websites. We work with you to ensure that you end up with the site that you want and need for your business. We help small to mid-size businesses, organizations, and medical practices in Hickory and the foothills region create and enhance their presence on the world wide web. Your business needs to be online. More people are turning to the internet when they look for local businesses and services. If you haven't done so already, now is the time to create and target your web presence. We specialize in professionally designed web presence sites (our websites don't take orders or process credit cards.) Our sites tell the world about your company or organization, and your products and services - in the best possible way. Let Foothills Data help you get your business or organization online today with a professional website tailored to your business needs. We are dedicated to the businesses in the foothills region. We design websites exclusively for businesses, organizations and doctors' offices in this area.